It’s July! A big month for orienteering! 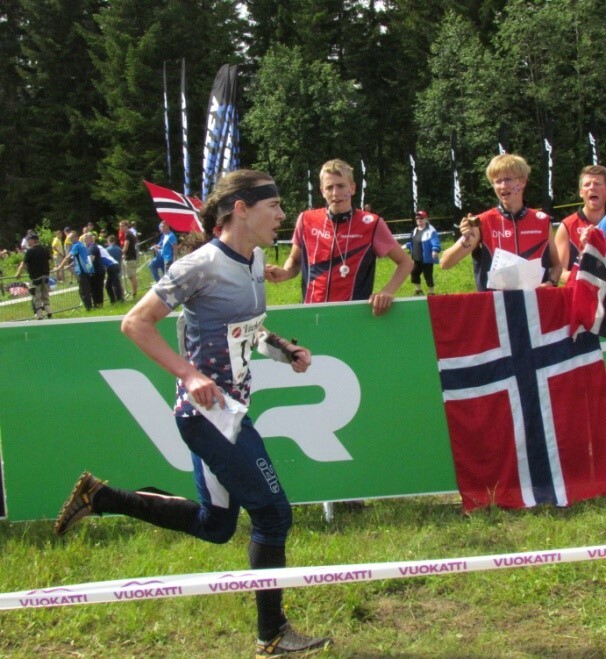 Team USA just competed in the World Orienteering, World Trail Orienteering and Junior World Orienteering Championships. In addition, we have BAOC’s Summerfest A-meet and the Annual General Meeting in a few weeks and clubs are hosting Summer Sprint series across the country. Who could ask for more? Led by Alison Crocker’s best ever American finish in a WOC final (18th place in the Long Distance) our Senior team had a strong performance at Finland’s World Orienteering Championships. Ali qualified for the finals in the Long, Middle and Sprint as well as ran the first leg in the Women’s Relay. Picture is of Ali in the finish chute of the long final. Isabel Bryant and Meg Parson led a twelve person American contingent in the Czech Republic. Under the leadership of Coach Erin Schirm, our Juniors continued to improve with one of our deepest teams ever. If you are interested in learning more about OUSA’s Junior and Junior Development programs contact Erin at emschirm@syr.edu. Back to Finland. Team USA’s three person World Trail Orienteering Championships Team completed each of their competitions, learned a great deal and plan to improve in 2014. Team USA’s MTBO squad is pleased to announce its first corporate sponsor: AutoPilot, makers of premium map holders for mountain bike orienteering. Based in the Czech Republic, AutoPilot’s PilotOne map holder is known for its quick and robust “no tools” installation. Through Team USA organizer Greg Lennon, these map holders will be available to US orienteers later this summer. Our MTBO team now has a Facebook page (facebook.com/usmtboteam) to help with it's mission to grow MTBO in the US and succeed in international competitions - FB fans, click here and Like away to support the team and get updates! The team continues to seek more sponsors (and donations) to help in their quest; please donate through the Facebook page or through OUSA's "Support" page. The 2013 World Mountain Bike Orienteering Championships will be held from August 26th-31st in Estonia. Orienteering USA’s Annual General Meeting will be on Saturday, July 27th as part of BAOC’s Summerfest A-meet weekend. The meeting will be held from 4:00 to 6:00 pm at the Truckee Community Center in Truckee, CA. As part of the meeting, member clubs will vote on two important by-laws changes. A communication has already been sent out on Clubnet elaborating these proposed changes. If you do not have access to Clubnet and would like a copy of the proposed changes, contact either Peter Goodwin at pgwolfe66@gmail.com or Glen Schorr at gjs@orienteeringusa.org. We look forward to seeing you all in Truckee. The Los Angeles Orienteering Club has just received sanctioning for a late Summer A-meet. On September 7-8 the club will host the “Barton Forest Frolic” in Angelus Oaks, CA, about 30 miles northeast of Redland. This is a new map so check it out! For more information visit http://losangelesorienteering.org/drupal/barton-forest-frolic-meet. It’s so big; it’s more than a day…more than a week! National Orienteering Week is a great way to get new folks to try our sport and join your club. If you are planning an event please contact OUSA Secretary Donna Fluegel as quickly as possible at fluegeldonna@sbcglobal.net. She will get an OUSA NOW packet out to you to help you with your event. Thanks to the Rochester Orienteering Club for holding an Olympic Day Orienteering Event in June. As part of the day, an Olympic fencer came and gave a brief talk. Thanks to Orienteer Kansas and Rocky Mountain Orienteering Club for hosting orienteering events as part of the Sunflower and Rocky Mountain State Games. This is the first time orienteering has been in these events. If your club is interested in either Olympic Day or a state games competition, contact Glen at gjs@orienteeringusa.org. If you want to save money on hotels and rental cars this summer, visit www.orienteeringusa.org and click on the Choice Hotels and Hertz logos. Orienteers can save money any time - these savings are not just for orienteering events! For the latest calendar visit www.orienteeringusa.org and click on “Find a National Event.” Don’t forget to check all of the sports…especially Mountain Biking for upcoming events.